Homemade peanut butter cups have been on the top of my “to make” list for a while, it’s a shame it took this long. Reese’s makes a pretty decent peanut butter cup but darn those things are addicting. To add to the trouble, those little buggers are quite pricey for a sorta-peanut-butter covered in plastic-like chocolate. The logical next step is to make them which at first seems like a lot of work, but they’re not. Once I worked up the courage to make my own I realized there was no reason they couldn’t be healthy too. Dark chocolate is high in antioxidants (which means you might live forever) and we all know peanut butter comes straight from the Fountain of Youth – how else can I explain the fact that after two of these I was crawling on the floor, drooling and uttering squeals of joy? By the way, these make an excellent Mother’s Day gift. 1. In a medium bowl mix 1C peanut butter, graham crackers and sugar together until well mixed. Put the chocolate into a microwave safe bowl and microwave on medium heat until just melted, stirring every 30 seconds or so. Mix 2T peanut butter into the chocolate. If the chocolate mixture is too thin place in the refrigerator for a few minutes – this will help make a thicker shell. 2. Place about 1t of the chocolate mixture into each ice cube hole or muffin liner. Once you fill 12 of them take the ice tray (or muffin liners) and tilt around to get all the sides covered in chocolate. Place the ice tray in the freezer until the chocolate sets, about 10 minutes. 3. Remove the tray from the freezer, place about 1T of peanut butter mixture into each chocolate shell and cover with the remaining chocolate mixture. You may need to microwave the chocolate again to melt it. Place the peanut butter cups back in the freezer for about 15 minutes. Remove from the ice trays and store in a sealed container in the refrigerator. The perfect mix! I almost tried to eat the picture! My mouth is watering..I just happened to buy some dark choc chips last week, not knowing what I would make with them. I do now, thanks for another great treat. Reese’s are addicting! Love that you used an ice cube tray. Clever! I just might have to whip some of these up as I’m working on holiday goodies right now! Yup! It’s such an easy method and they’re reusable! I love homemade PB cups! These sound amazing! An excellent holiday gift? No way, I’m keeping those all to myself :D YUM those look great. I’m a big fan of peanut butter cups. It’s kinda hard to go wrong with chocolate and peanut butter. I made a version of these a few weeks ago as holiday gifts, but I used honey instead of sugar. So delicious! 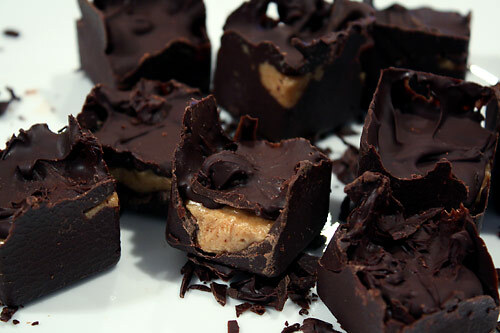 Many homemade peanut butter cups call for powered sugar. You didn’t specify so is regular granulated sugar ok? Yup! I used granulated sugar and it worked fine. It nothing else, it lends a little more grittiness along with the graham cracker crumbs to the texture! Stevia is an all natural sweetener (from the stevia plant)……no calorie as well. I use it in all my baking. This is a great way to make it even healthier and of course, all natural. True, Stevia would work as well, but I really don’t like the taste of it. I’ve tried several times to use Stevia in coffee, tea, baking, etc.. and I just can’t stand the taste! Btw, why graham crackers? If you’re looking for texture, why not add ground Fiber One? Or just grind your nuts to an “almost creamy” consistency. Anything should work, you could even use saltine crackers! But you’re right, if you start with a coarser ground peanut butter, you probably wouldn’t need to add anything else besides sugar. I have been making homemade peanut butter cups for many, many years since my children were very young. My recipe is a little different. My sister got the recipe from Wilton when she went to a demonstration. I use mild chocolate but can probably substitute dark chocolate. I get my chocolate from a candy store. They come in discs. I also use Karo Syrup, powedered sugar, and a stick of margarine (not butter). They are so easy to make. I make them now every year for Christmas.